Mid-May to mid-September is the ideal time to visit Alaska. 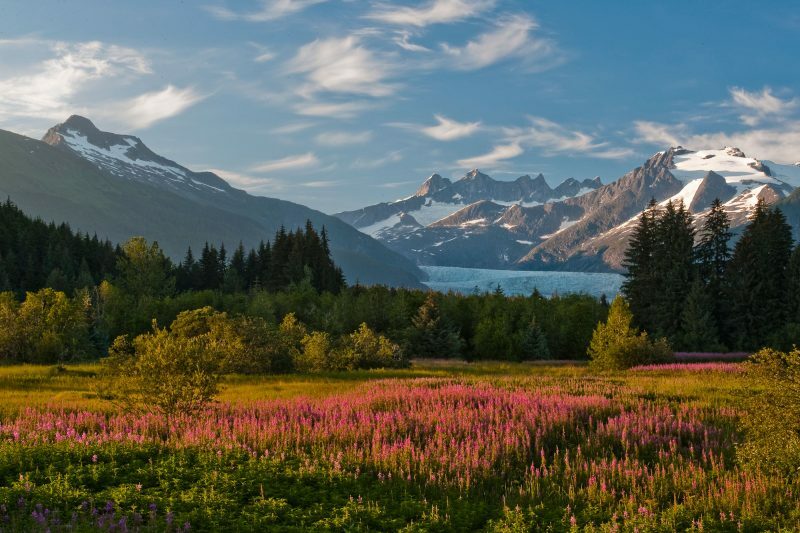 From late spring to early autumn, the days are long, wildlife viewing is at its peak and there’s a wide choice of things to do, from whale watching in Kenai Fjords and grizzly bear viewing in Denali National Park to small-ship cruises along the Inside Passage, epic self-drive adventures or a journey on the Alaska Railroad. When is the best time to see bears in Alaska? During spring, the warmer temperatures and longer hours of daylight stir bears from hibernation. 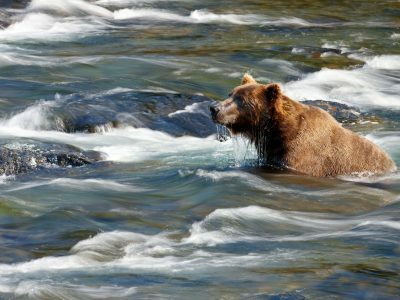 Optimum bear viewing coincides with the salmon runs when grizzlies concentrate around rivers. In prime spots, like Brooks Camp in Katmai National Park, this occurs during July. 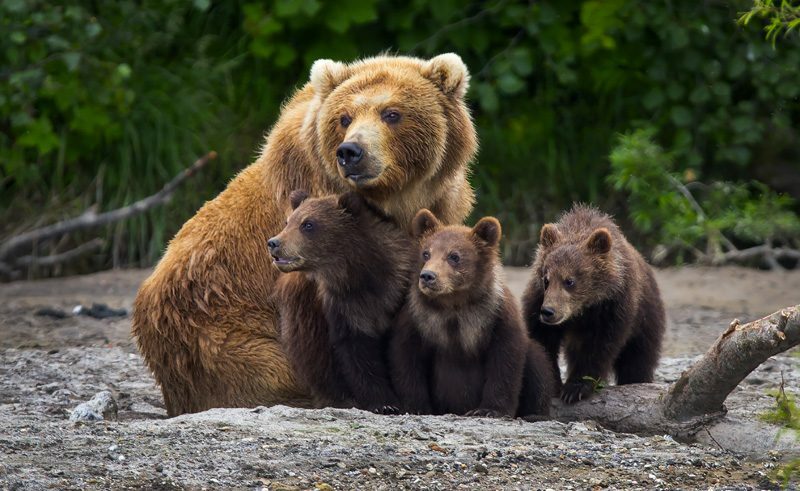 When the salmon are not running, bears (both black and brown) range further afield and can be found foraging along coasts or prowling the tundra of inland national parks like Denali. 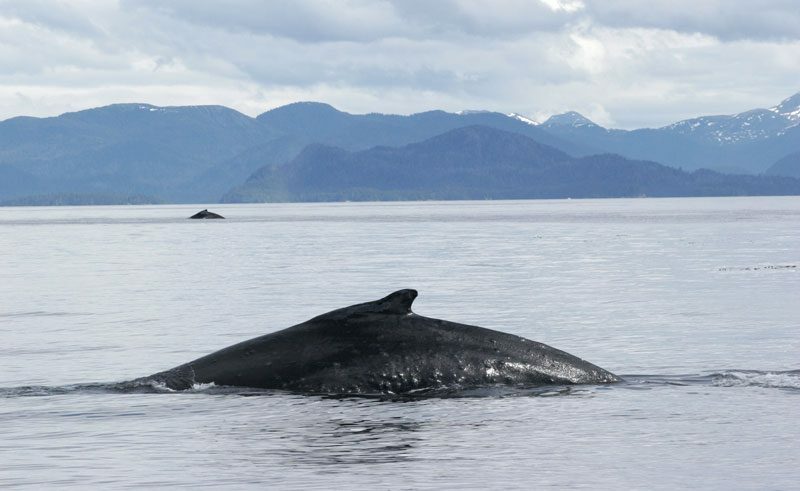 Summer witnesses the arrival of humpback whales, migrating from Hawaii to feed in Alaska’s coastal waters, including the Kenai Fjords and Inside Passage. June and July are the best months to observe their unique bubble-net feeding tactics. Summer is also prime time for spotting Alaska’s resident pods of orca. Blue whales are rarer and more often seen further offshore, while beluga whales are frequently sighted in Cook Inlet near Anchorage. Are there mosquitoes in Alaska? Mosquitoes are mainly active in early summer and are more often found in the interior where lakes and saturated areas of tundra provide ideal breeding conditions. By August they have usually disappeared from all but the wettest areas. Come prepared with insect repellant – and remember that mosquitoes are a crucial part of the food chain that sustains Alaska’s extraordinary wildlife. Most tours operate from mid-May to mid-September, so if you want the maximum choice of things to do, this is the best time to visit Alaska. The sky is light for much of the night between late May and late July, with 21 June (the longest day) boasting 19 hours of daylight in Anchorage and 21 hours in Fairbanks. 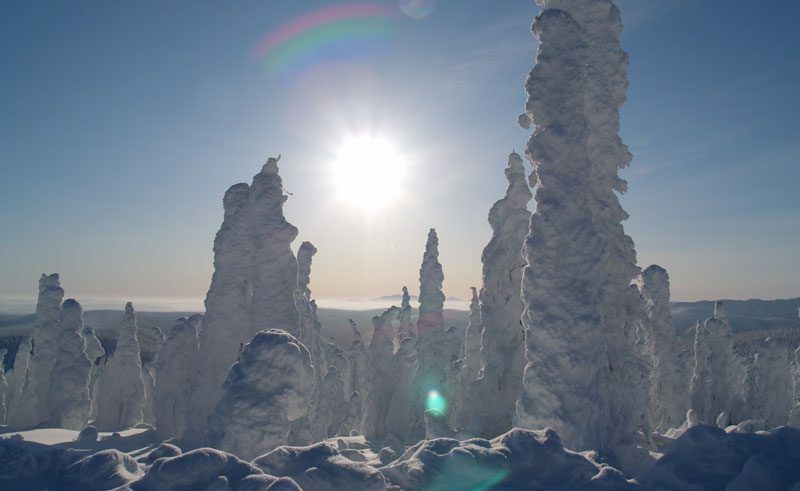 Venture to the Arctic Circle (about 200 miles north of Fairbanks) and you can experience the midnight sun. The shoulder months of May and September are less busy, but can still enjoy good weather. During the peak season, July to mid-August, you should book as far in advance as possible. In Anchorage, average maximum daytime temperatures reach around 17-19°C during June, July and August. In May and September, this drops to around 13°C. During winter, expect daytime highs of around -3°C. Juneau is slightly milder during winter months, while Fairbanks has more extremes of temperature – up to 23°C in July and down to -17°C in January. Average monthly precipitation in Anchorage ranges from 12mm in April to 83mm in August; Juneau is generally wetter, while Fairbanks is drier. June and July are the sunniest months. 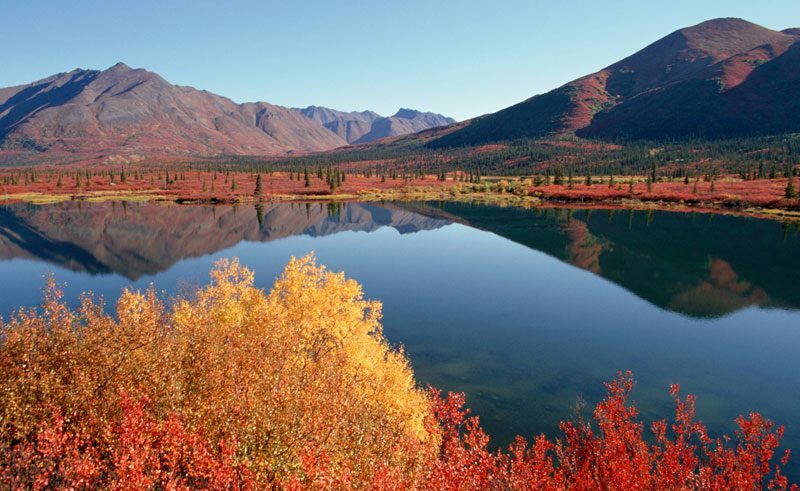 Autumn is a beautiful season in Alaska with much going for it. 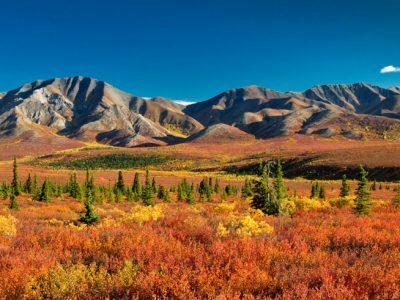 The tundra turns gold and orange (a magnet to photographers), while bears are busy feeding on berries and the last scraps of the September salmon run to put on weight before hibernation. As days draw in, there is always the possibility of the northern lights appearing, particularly around Fairbanks and the north. September also sees a dramatic drop-off in visitor numbers. The flip-side is that autumn inevitably has cooler, more changeable weather; wildlife activity is tailing off and many tours and attractions will start running reduced schedules – or close until the following spring. Northern lights and winter activity holidays are available from December to March/April, set against a spectacular backdrop of snow-covered mountains and frozen lakes. Prices are lower and excursions include dog-sledding, skiing and aurora hunting. Barrow, Alaska’s northernmost town, experiences the polar night during mid-winter when, for 67 days, the sun does not rise. I haven't stopped talking about my very first encounter with grizzlies ever since I got back from Alaska! We caught up with William Gray to find out why Alaska is a great family-friendly adventure holiday destination.